The Relief Plus Disposable Instant Ice Pack (Box of 10) is a premium ice pack that contains 50% more active ingredients than standard ice packs, allowing it to stay colder for longer periods of time. Free from ammonium nitrate, it is the ideal product to aid in treating sports injuries, sprains, strains and abrasions. Each 150g Instant Plus Ice Pack has been created for single-use treatment to relieve pain, swelling and inflammation of injuries. Not only is it regularly used in the first aid treatment of sports injuries, but it is also commonly used in physiotherapy. It can be used on a whole host of injuries, and is easily mouldable to most areas of the body, including the shoulders, elbows, hips, lower back, knees and ankles. 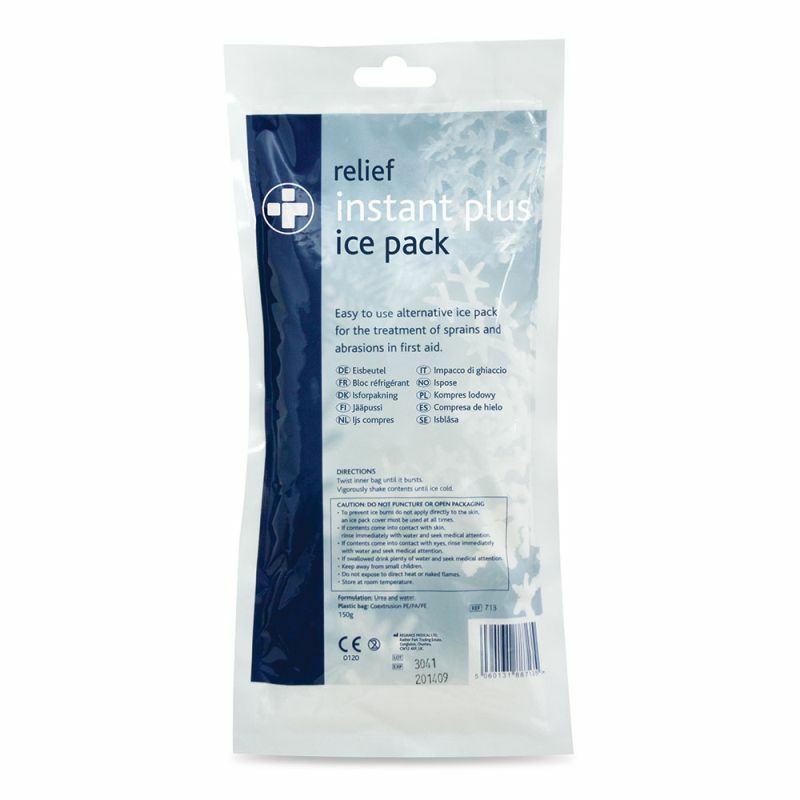 To activate the Instant Plus Ice Pack, twist the pack until you can feel the inner bag burst, and then shake the contents of the pack until you can feel the desired level of cold. Apply the pack over the injury using an ice pack cover to avoid ice burns, and leave on the affected area for 20 to 30 minutes, regularly checking the colour of the skin. If the skin turns a bright pink or red, please consult a doctor immediately. The Relief Plus Disposable Instant Ice Pack (Box of 10) is usually dispatched via First Class Royal Mail and delivery should be within 1 to 3 working days.